Matthew 19:16-26 16 And, behold, one came and said unto him, Good Master, what good thing shall I do, that I may have eternal life? 17 And he said unto him, Why callest thou me good? there is none good but one, that is, God: but if thou wilt enter into life, keep the commandments. 18 He saith unto him, Which? Jesus said, Thou shalt do no murder, Thou shalt not commit adultery, Thou shalt not steal, Thou shalt not bear false witness, 19 Honour thy father and thy mother: and, Thou shalt love thy neighbour as thyself. 20 The young man saith unto him, All these things have I kept from my youth up: what lack I yet? 21 Jesus said unto him, If thou wilt be perfect, go and sell that thou hast, and give to the poor, and thou shalt have treasure in heaven: and come and follow me. 22 But when the young man heard that saying, he went away sorrowful: for he had great possessions. 23 Then said Jesus unto his disciples, Verily I say unto you, That a rich man shall hardly enter into the kingdom of heaven. 24 And again I say unto you, It is easier for a camel to go through the eye of a needle, than for a rich man to enter into the kingdom of God. 25 When his disciples heard it, they were exceedingly amazed, saying, Who then can be saved? 26 But Jesus beheld them, and said unto them, With men this is impossible; but with God all things are possible. Dormition 2009. Explanation Of The Dormition Troparion. Audio Homily. Dormition hymns: The Furnace and the Theotokos. The Three Holy Children. The Angel of the Lord. The Best time to hear the hymns of the church. Everything depends on our disposition. Aug 13/26 2009 Two Days before Dormition. I am amazed at how often the hymns at the end of vigil seem so much more profound and beautiful than those at the beginning. I do not think they are of substantially higher quality, although it could be argued that the “Canon” is the masterpiece of all Orthodox hymnology, but I do believe that WE are of higher quality! Standing (sitting, pacing, having an itch, having your mind wander, thinking about how your feet hurt, getting hungry, etc, etc) during the vigil prepares us for holy moments when something being chanted seems to permeate to the very depths of our soul. We are not “quiet” at the beginning of vigil. Our souls are coarse, noisy. It takes some seasoning for us to be prepared to “sit at the feet” of our Lord, and contemplate the one thing needful. Towards the end of vigil, we have quieted down somewhat, and are prepared for something fantastic, although ineffable and invisible, and perhaps even barely discernable, to happen in our soul. If you have not experienced this type of “Theophany” during the evening service, then come to vigil – all of it, as often as can. It will happen for you, but I warn you, if you are not accustomed to long vigils, you will have many attacks that make you want to leave. You cannot feel anything until you are made ready. This will take consistency, and TIME. Don’t expect the first or even the thirtieth vigil in a row that you attend to bring you great consolation, but it will come if you are patient. Here before us we have a holy metaphor. The Theotokos, amidst her many other names (“jar of manna, “gate that remained shut“, “ever-virgin“, “rod that budded“, etc) is now likened to a furnace. 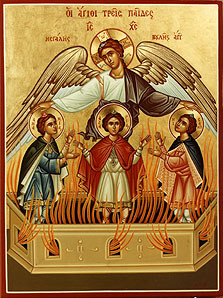 The furnace in which the three youths were cast contained flame, and then was visited by the divine flame, the “Angel of the Lord”, who is none other than Jesus Christ, in an appearance before His bodily incarnation (when you see “Angel of the Lord” in the OT, translate this to “Jesus Christ”). The Theotokos is the furnace that also contained the Divine Flame, Jesus Christ, however in her case, He is fully incarnate, God and man. In both furnaces, the flame burns the ungodly and refreshes those who love God (which the hymn calls "venerable"). God is the same, to the righteous and unrighteous. The action of the fire in the furnace demonstrates this truth. The Chaldeans who were feeding the furnace we slain by the flames, but the three holy youths considered them to be a “moist dew”. It is the same with the Divine flame, Jesus Christ. The ungodly are burned, and the righteous are refreshed. The recent feast of the Transfiguration should teach us that becoming righteous is a process of long duration and great difficulty; we are not immediately ready to be in the presence of God after our baptism because we have not changed enough yet. The three apostles were terrified and confused in the presence of the uncreated Divine Light. They eventually were ready, but not until great trials, difficulties, falls and repentance. How can it be any different for us poor ones? The unmerciful debtor. It is all about imitation. Audio homily. 11th Sun 2009. Matthew 18:23-35 23 Therefore is the kingdom of heaven likened unto a certain king, which would take account of his servants. 24 And when he had begun to reckon, one was brought unto him, which owed him ten thousand talents. 25 But forasmuch as he had not to pay, his lord commanded him to be sold, and his wife, and children, and all that he had, and payment to be made. 26 The servant therefore fell down, and worshipped him, saying, Lord, have patience with me, and I will pay thee all. 27 Then the lord of that servant was moved with compassion, and loosed him, and forgave him the debt. 28 But the same servant went out, and found one of his fellowservants, which owed him an hundred pence: and he laid hands on him, and took him by the throat, saying, Pay me that thou owest. 29 And his fellowservant fell down at his feet, and besought him, saying, Have patience with me, and I will pay thee all. 30 And he would not: but went and cast him into prison, till he should pay the debt. 31 So when his fellowservants saw what was done, they were very sorry, and came and told unto their lord all that was done. 32 Then his lord, after that he had called him, said unto him, O thou wicked servant, I forgave thee all that debt, because thou desiredst me: 33 Shouldest not thou also have had compassion on thy fellowservant, even as I had pity on thee? 34 And his lord was wroth, and delivered him to the tormentors, till he should pay all that was due unto him. 35 So likewise shall my heavenly Father do also unto you, if ye from your hearts forgive not every one his brother their trespasses. Why were Moses and Elias with Christ on the mountain? When Christ was transfigured on the mountain, Moses and Elias appeared conversing with Him. Why were these two present, out of all the righteous of the Old Testament? The service texts explain this. There are two equally valid answers. One has to do with the respective ministries of the two saints, and the other with a very important difference between them. The Holy Moses was a prophet, but also, unlike any other personage of the Scripture, the one God chose to communicate the Law to His people (when he brought the Ten Commandments down from the mountain, and subsequently was the mouthpiece of God to proclaim the other laws found in the Pentateuch). He therefore, more than anyone else, is associated with the Law. Te Holy Prophet Elias was one of the greatest prophets. Therefore, Jesus was converging with a representative from the “Law and the Prophets” showing that He is in complete agreement with each. “Good to Know” is a semi regular posting of some point of doctrine, scriptural exegesis, liturgical topic, or other item which, for an Orthodox Christian, is “good to know”. Some topics will be in questions and answer format. Submissions of topics to the webmaster are encouraged. If we like your submission, we will publish it, and credit you. Blog posts & local parish news are posted to our email list. Sometimes “Good to Know” questions are published here in 2 parts, to encourage readers to give their response before seeing the answer. Go to here: http://groups.google.com/group/saint-nicholas-orthodox-church to join. Human nature in the midst of the Divine. You can watch this sermon on the following video platforms: YouTube, Yahoo, MySpace, Metacafe, Google, Revver, DailyMotion, Blip.TV, VeohSYNOPSIS:There is a startling contrast between Moses and Elias and the Apostles during the Transfiguration. The Apostles show they were not yet ready to fully experience Divine nature because of their sleepiness, confusion and fear. Moses and Elias were perfectly at peace in the midst of the uncreated light. Humanity was created to be able to perceive the Divine uncreated light, but we must be prepared for it. 10th Sunday. The Exorcism Of The Lunatic Son Why fast? Audio Homily 2009. Matthew 17:14-23 14 And when they were come to the multitude, there came to him a certain man, kneeling down to him, and saying, 15 Lord, have mercy on my son: for he is lunatick, and sore vexed: for ofttimes he falleth into the fire, and oft into the water. 16 And I brought him to thy disciples, and they could not cure him. 17 Then Jesus answered and said, O faithless and perverse generation, how long shall I be with you? how long shall I suffer you? bring him hither to me. 18 And Jesus rebuked the devil; and he departed out of him: and the child was cured from that very hour. 19 Then came the disciples to Jesus apart, and said, Why could not we cast him out? 20 And Jesus said unto them, Because of your unbelief: for verily I say unto you, If ye have faith as a grain of mustard seed, ye shall say unto this mountain, Remove hence to yonder place; and it shall remove; and nothing shall be impossible unto you. 21 Howbeit this kind goeth not out but by prayer and fasting. 22 And while they abode in Galilee, Jesus said unto them, The Son of man shall be betrayed into the hands of men: 23 And they shall kill him, and the third day he shall be raised again. And they were exceeding sorry. What happened on the Cross? Dispassion. We are singing about the cross again – it must be Wednesday or Friday, when we meditate in our hymns about the cross every week of the year. This hymn, from Tuesday Vespers (remember, the Vesper service points to the next calendar day, since it is the beginning of the liturgical day for us) points out with particular clarity our Orthodox doctrine of the cross. We consider our Lord’s death on the cross to be a part of His entire ministry, which was accomplished from His incarnation till His ascension and subsequent sending of the Holy Spirit on Pentecost. He did not become man to take on a punishment for us so that we would not be punished, as most Protestants think. What an idea! – That God would punish His son to avoid punishing us. What good is forgiveness if we do not change? Sin is painful – is hurts the soul. A forgiven sinner is still a sinner, and is sick. Jesus Christ came to enable us to stop sinning and become perfected. When we look at the cross, we should see redemption, and not only forgiveness. The redeemed man changes, so that the sources of his pain are obliterated, and he obtains perfect peace. Our hymns bring this point home many times. We also speak of our Lord’s exploits on the cross in order to emulate Him. Just as He voluntarily gave Himself over to His Father’s will, so must we voluntarily give ourselves over to His will. Dispassion is a difficult and technical theological term. The ascetic fathers have written many things about this term. This short article cannot hope to explain it, and only those who have become completely dispassionate can understand it, so I can only understand is as “through a glass darkly”. Here are a few quotes from the Fathers about dispassion. This will need to be enough for now. "Love, dispassion, and adoption are distinguished by name, and name only. Light, fire, and flame join to fashion one activity. So too with love, dispassion and adoption." St. John Climacus. Guidelines for reading, with freedom for departures. What we do IS who we are with. EVERYTHING we do affects our intelligence. We are almost at the end of First Corinthians in our daily readings. The cycle of daily readings throughout the year begins after Pascha. We read the Gospel of John during most weekdays, and then begin Matthew, followed by Mark, then Luke. We are still reading selections from Matthew, since it is such a long Gospel. We began serializing Acts after Pascha, then proceeded to Romans, and are now finishing First Corinthians, and will go on to the other epistles of St Paul. We read more or less in order, from beginning to end, but skip many selections which are reserved for a particular weekend of the year (Saturday or Sunday). I recommend highly that you read the weekly readings. They are easy to find – in our calendar or using the Menologion program. They can be found easily in English or Russian online. If you are like me, when you read the daily readings, you may feel frustrated because the context of the reading is brief, and there is something important immediately before or after the selection. This is no big deal. We read to be edified, to learn, to feel compunction and glean wisdom., There is no rule that you cannot search out the context of the reading, either in a paper bible, or as I generally prefer, using a program on your computer, such as “e-Sword”. Having the discipline to read SOMETHING, in SOME KIND of order is very important, and on our better, more attentive days, we might use that reading as a launching pad into other parts of Scripture. I follow the same plan when I read the Fathers. I am reading the Conferences by St John Cassian right now (and plan to have many journal entries about it, if I can somehow put into words the sublime feelings always present when reading this classic). The Conferences are extremely rich in Scriptural references. One reference led me to read almost the entire book of Esther. This is not a good plan if you want to finish a 500 page book in less than a year, but after, all we are not in a race to read books and any attentive spiritual reading will help us finish the race we are in. I love the King James, because it reads so poetically, but sometimes it is good to see other ways a verse is rendered. This sounds like something our mothers have told us many times; it has passed into the secular wisdom of many cultures. This idea is so common, that I fear that its awesome truth is lost on us, because of familiarity. St Paul was actually quoting the secular wisdom of his day, the Greek poet Menander (the lost comedy of Thais). I like this version of the proverb very much. Everyone knows that green logs do not burn well. One can even put flame to a green log and be unable to burn it. But when such a log is put with other dry logs in a fire, over time, it will catch fire from them and be utterly consumed. This is a graphic illustration of the effect of the company of men upon our morals. Anyone who considers himself to be immune to losing his morals is a fool. How many drug abusers have said: “I won’t use drugs, even though my friends do. I’m not that stupid”. How many who use foul language learned it first from those they associated with? How many have secular opinions that are strikingly against the law of God, concerning for instance, abortion or “living together”, because they have listened to their non Orthodox or secular friends or the steady drone of the television set, with its immoral shows and radically lost newscasters? We are not only influenced by the people we choose to associate with, but also the things we do. Television, radio and the movies are also associations (or as the King James has it “communications”) with people. There are not a whole lot of good and edifying things in those mediums. We may laugh at a joke on Letterman, and forget that it expresses foul and loathsome things (not to mention that if we are watching TV late at night, it is doubtful that we will pray before bed). We are polluted by such associations and because of them, we change in a way imperceptible to us. This is because the things we do, think and say ALWAYS affects our intelligence. We cannot listen to a dirty joke, or casual swearing, or nod our head with secular opinions, or watch yet another TV show where fornication is as common as breathing without being affected. If we lose the ability to recognize right from wrong, we are undone. It is not that all these things are fire, and we are straw. Instead, they are water, and we are wood. Eventually, after sitting in water a while, wood rots and no longer resembles what it once was. It is useless as wood; it has become trash. There is always a danger when we attempt to “not walk in the council of the ungodly” that we add our own vanity and pride to the effort and become pharisaical, and avoid people out of some kind of misguided piety. We live in the world. Mere association with people will not pollute us; everything depends on our purpose, motivations and disposition. I am a nurse and have taken care of many drug addicts and alcoholics. I assure you, seeing their condition did not in any way make me want to take drugs. Some of you work in offices. You cannot avoid the immoral, but you can be different than them, and not participate in their jokes, and gossip and immoral opinions. This reminds me of a funny story (to me at least). I was young (once) and working as a software analyst. We sometimes went out to lunch together. One day the group decided to go to “Hooters”. I kid you not, I had no idea what “Hooters” was. I wondered at the time if they had a décor based on pictures and statues of owls. We were all ready to go, when I saw a couple of guys smirking and looking towards me. My radar went off, and I excused myself, and only later found out what this restaurant really is. The group was trying to haze me, because they considered me to be uncool. What they did not realize is that I considered their efforts to be a compliment – they had recognized that I did not hold the same kind of opinions and have the same lifestyle as they did. 1Corinthians 9:24 KJV Know ye not that they which run in a race run all, but one receiveth the prize? So run, that ye may obtain. “Adam Clarkes Commentary on the Bible” for 1 Corinthians 15:33, accessed from the e-Sword program. You are currently browsing the Saint Nicholas Orthodox Church blog archives for August, 2009.